OK, so GSII got cancelled by storms in '08, it was still on the calendar, and we had a hell of a potential lineup of participants. '07 was a blast, and I hope to see the same crew re-assembled this year plus a whole lot more. 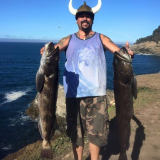 Let's get the planning started for what will be a way-too-long-awaited rockfish and lingcod opener up here. May 15, the opener, is a Friday. I'm putting in for a 3 day, 2 night pass from mama and the kiddoes. I like to go Phat-Pimp and stay in one of the hotels right along the rocks at Coral Point - probably The Tides Inn for around $120-$150/night. I did some work for the owner of the campground recently too, so I may be able to swing a group rate for a bunch of connected campsites. 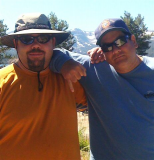 This is going to be serious - yakfishing, crabbing, ab diving, foodfest, beer garden, sightseeing... Maybe we'll even get some FAC WX and be able to venture out on a field trip north or south along the Lost Coast for some old growth hunting. myself and at least one amigo are in. LONG LIVE THE KING !! O.K. I've gone as far as to note it on my calendar. I can hardly plan for a week out, much less months, but I'm game so far! sponsored by: Piscean Artworks "Fish Tribal!" Randomness rules the universe. Perseverance is the only path to success..but luck sometimes works too. "King" might as well just be a contraction for Kayaking - yeah, that's it, AbK'ing. It's not about me - it's about the peeps! (my royal subjects! ). I'm actually a jester masquerading as a king. This is gonna be good. 3 months and a week is a long time to be Jonesin' this hard. Count me IN! Love to fish with the northern guys! Still not sure if this is GS2 or GS3.....but you know I be there. The legacy continues. Pat, want to car pool again? ABFool ( ) , I am up for the plush too. It makes me in a better mood for more fishing. ABFool ( ) , I am up for the plush too. It makes me in a better mood for more fishing. Roommate potential open, Etienne - I gotta figure out if the fam is going to accompany at all... You too? Claire is 9 going on Terrible Teen w/ attitude, so maybe she and your daughter would hit it off. All are certainly welcome and I'm forgetting some, so slap me with a fine (I owe you a beer - 1st 6 on PK ) and chime in here. Im so down for that! Count me in!! Boy, I'm gonna need to work up to this event! Looks like its time for me to get serious about that new yak too! We are in .......only if you can promise the same "great" ocean conditions that we experienced last fall. I am looking forward to expanding my range this year. It will be great to meet some new yakers as well. Count me in it is already on my calendar.